Since I was a teenager I have been going to the annual William Ashley’s Warehouse Sale every year with my mom, and now continue the tradition with my family. The Warehouse Sale located at 111 Creditview Road, Vaughan, ON, L4L 9T1 is more spacious and has an ample amount of free parking. 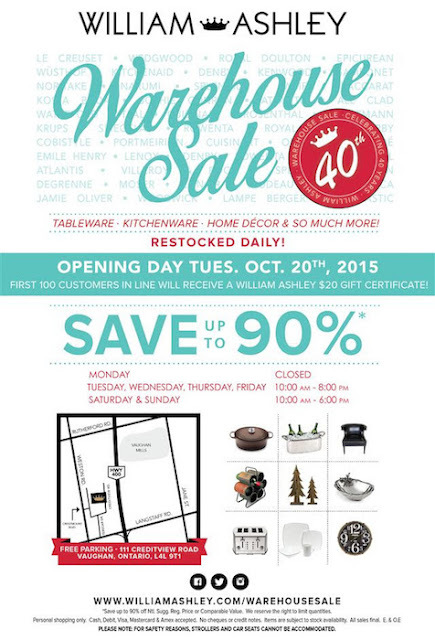 This year William Ashley celebrates its 40th annual Warehouse Sale, where shoppers across the GTA gather to take advantage of the fabulous prices on quality products. Since 1947, William Ashley’s Bloor Street store has been a Toronto landmark and the destination for North America’s largest selection of tableware, kitchenware and home décor because their buyers shop the globe all year to ensure the best selection of current merchandise from world-renowned brands are available there. The William Ashley Warehouse Sale was the first warehouse sale in Canada, providing customers with amazing deals right before the busy holiday season. There are 22 departments filled with everything from tableware, kitchenware, home décor, lighting, furniture, holiday gifts, toys, bed and bath accessories, corporate gifts and much more at incredible savings of up to 90% off retail prices on sale until November 22nd. New items arrive weekly to re-stock the shelves for this incredible four week event, including a vast array of items exclusive to the sale that are not carried at the store. I think it is the perfect time to buy fabulous gifts for for our loved ones and us. Over the years, I have bought lots of home décor items and cool kitchen gadgets and tools at the William Ashley’s Warehouse Sale that are either expensive or hard to find elsewhere such as my bread dome, madeleine pans, Bohemian vases, cast-iron pan, woks and much more. This year too I got a few more goodies that I am eager to start using! The sale will be open until November 22nd Tuesday to Friday 10 am – 8 pm and on Saturday and Sunday 10 am – 6 pm. They are closed on Mondays. To win weekly prizes and get information on DAILY DEALS during the sale follow @WilliamAshleyCo on Twitter and on Facebook at William Ashley China. Hope you take advantage of the sales before it's over! we don't own a car, so it's hard to get there. I wish I lived closer, the butterfly dishes are very pretty. looks like a wonderful store! I have never heard of this store. Looks like it has nice items!